Whitehawk Football Club suffered cup heartbreak when they lost their FA Cup second round replay 3-2 at home to Dagenham & Redbridge after extra-time this evening. National South Whitehawk had drawn 1-1 at League Two Dagenham earlier this month, when Jordan Rose headed home deep in injury-time to earn Hawks the replay. There was a big incentive for the winners of the tie, with the victors travelling to Premier League Everton and Dagenham will now make the trip to Goodison in January. Hawks took the lead in front of a club record crowd of 2,174 through Danny Mills on 32 minutes but Dagenham hit back to lead 2-1 with goals from Kyle Vassell and Josh Passley. However, Juan Cruz Gotta headed Whitehawk level with the equaliser three minutes into injury-time to force extra-time. Ayo Obileye put Dagenham back in front ten minutes into the additional 30 minutes and that was enough to send the League Two side through. Whitehawk, Sussex County League champions in 2009-10, started the game brightly and forced three corners in the opening three minutes. They almost went ahead on 18 minutes when Dagenham defender Joe Widdowson headed a free kick against the base of his own post. It was Dagenham who threatened next when experienced striker Jamie Cureton fired just over from 12 yards on 27 minutes. Hawks went ahead just five minutes later when Jake Robinson got to the byline down the right-hand side and crossed for Mills to head home from a couple of yards. It was Mills’ eighth goal in the FA Cup this season and 18th in total this campaign. The visitors levelled a minute before half-time, when Vassell turned substitute Gotta, who had replaced Dean Leacock just moments earlier, and rifled a shot into the roof of the net. Robinson went close five minutes into the second half when his well-struck free kick was tipped over by Dagenham keeper Mark Cousins. Hawks had used all three substitutes by the 56th minute, with Rose and Scott Neilson replacing the injured Paul Lorraine and Dave Martin early in the second half. Robinson had another opportunity on the hour but dragged his shot wide of the far post. Dagenham took the lead 13 minutes from time when Cureton broke down the left and crossed for Passley to side-foot home from 12 yards. The Daggers could have increased their advantage three minutes later when they broke forward in number but Cureton shot wide from 20 yards, with team-mates in support. Whitehawk pressed for a leveller and Arnaud Mendy fired over from 20 yards with four minutes to go, before Robinson’s powerful strike was superbly tipped over by Cousins in the third minute of injury-time. From Sam Derring’s resulting corner, Gotta rose highest to head home Hawks’ equaliser to force extra-time. In the extra period, Dagenham went back ahead on 100 minutes when Obileye headed home Ashley Hemmings’s corner from close range. 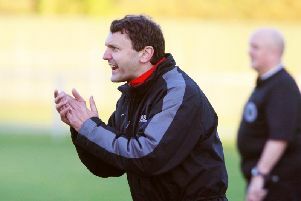 The visitors were reduced to ten men five minutes from the end when James Dunne was dismissed for two bookable offences. Dagenham survived a big goalmouth scramble a minute later and Cousins pushed over Mills’ injury-time shot as the visitors progressed into the third round.